"I never planned to have a garden, but it came to me in 1998 when I moved to a flat in Gray’s End Road in Clerkenwell, a flat that had a little ledge outside the top window, where I found a window box that was completely overgrown with weed. That summer I was in Italy, and I collected some acorns from a friend’s garden, and I pressed them into the weeds, and then the next year I had these little tree saplings. And over the course of three years I photographed this window box, which became a sort of minature garden, and even though it was tiny, it felt like a sort of enclosed world. And then I moved and I took the window box with me, and I moved to an ex-council flat which had one of these balconies where you access the flat from an outdoor walkway and I began to collect more plants. And then I bought an apple tree. In the first year I had the tree, children were stealing all the apples, so on the last one I put a post-it note saying ‘please leave this one’. I began to photograph it – not really as a project, but it was just an intuitive reaction because every day I walked past this developing growth, and these ripening apples. That is typical for how I work, that things often only afterwards turn out to be serious, and I don’t ever plan them as that, but later that I realise that there is now a solid group of several works together." 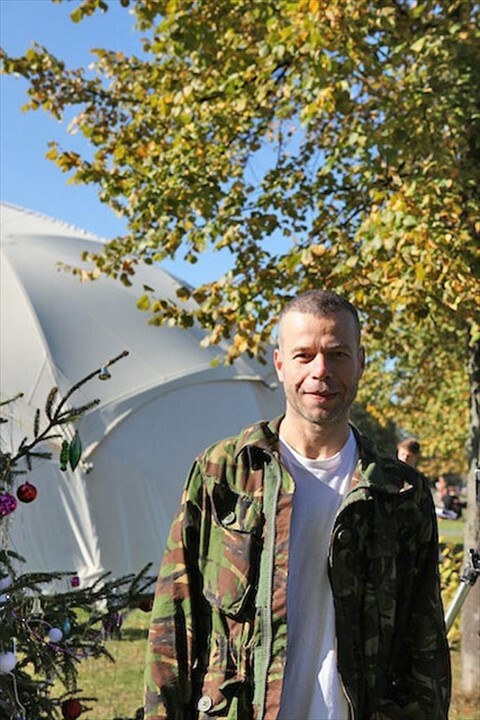 Of all the Turner prize-winning artists to be found discoursing on gardens, to see Wolfgang Tillmans alighting the stage should really be no surprise. A photographer who ranges across, and often beyond, his genre, he has captured iconic portraits, chronicled the fantastical reality of the party scene in pre- and post-Wall Berlin, worked extensively in the fashion industry, and recently published a compilation of his beautiful and somewhat unnerving Abstract Pictures. Last weekend, at the sixth Serpentine Gallery Garden Marathon, in a talk entitled Ursuppe and Other Garden Pictures, Tillmans discussed a range of images that track a burgeoning fascination with plantlife, which began in a overgrown box on a window sill and is now expressed in a plot of urban land in Berlin, which he has left fallow and returns to regularly to record the untrammeled changes of the nature that grows there. Wolfgang Tillmans: Abstract Pictures is out now, published by Hatje Cantz. Suggested Reading: The Hunger celebrated the world of al fresco garden dining in their piece on the restaurant at Lucknam Park here.